Somewhere along the way Thom fell in love with himself. Or maybe not himself, more his music, but it’s hard to blame him when so many millions of people fell in love with Thom too. We’re now long past the whiny, public school kid from a town whose redeeming characteristic was once described by Bill Bryson as a well kept council estate, and with a hit song amounting to an extended exercise in self pity. We now have huge, media-hungry releases and epileptic fits masquerading as music videos. He hasn’t gone full Michael Jackson with fame, not yet, but the effect fame’s had on poor Thom is unmistakable. Self obsessed, self involved and self assured enough to form a supergroup with some of the biggest names in music then absolutely dominate it, Thom’s a new man. The crux of this paragraph is all of it shows in his music. 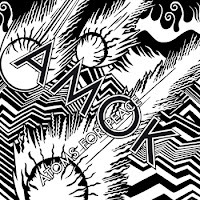 Atoms for Peace is a Thom only affair and the only whiff of influence to be found in Amok is of Radiohead. If Thom was the man he is today at the beginning of the millennia, he would have made this exact album instead of Kid A. Musically and structurally we see no real progression: the same scattered drum pallets and samples are still popping up, even similar song ideas can be easily noted, but the direction and mood is much different. After the never ending progression of Radiohead it might be the case that Atoms for Peace is allowing Thom to visit old styles with a new headspace. If this is the case he certainly seems to be making the most of it. Plenty has changed despite this, creating a sound which for better or worse is distinctly Atoms for Peace. As an album, Amok rushes feverishly between the two polar ends of Thom’s cannon: from crescendos to a repeating percussion-lead hypnotism. The former manifests itself in “Default” and “Unless,” with steadily rising synth and vocal combos surfing the wave of percussion to a kind of desperate emotional outcry. Rapid pacing makes it seem more like an escape into something than a cry for help, and therefore more appropriate for the man dancing manically than the one crying in a shopping trolley. The latter features Thom singing to a lonely beat at his highest and softest with a seemingly random array of accompanying sounds. It isn’t unsurprising following the self-description of his writing process -i.e. dragging himself backwards through a hedge- but the more experimental vibe is much more befitting to the new group. 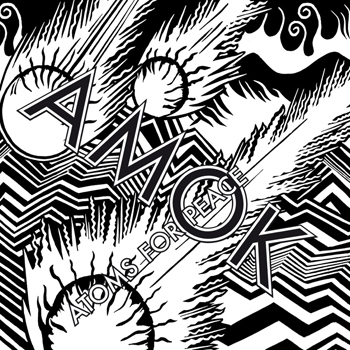 Tracks displaying this, such as “Amok” itself, do seem at ends with the more outwardly emotional parts of the album, but it strikes closer to forward-thinking than Thom’s tendency to play with the past. Nigel (veteran Radiohead producer), Flea (RHCP), Joey (Beck; R.E.M.) and Mauro (!) eventually get their say in the scattered rhythmic scenes in Amok. Behind the In Rainbows-esque guitar strums, “Stuck Together Pieces” displays the band at work. Inventive percussion and a bass full of a little bit more funk serve as a reminder of the three extra members, though most of the time there’s little to see past the airtight seal of Thom’s personality. Whether you warm to Amok or not is largely down to whether or not you can stand Thom being in love with himself for 9 songs. It’s inventive, sensitive, beautiful and incredibly interesting, especially for someone who’s spent a great deal of time exploring Thom’s previous work, but at the same time the album teeters on the edge of smugness. Despite this, and ignoring the fact this praise may be the final straw in pushing Thom’s ego over the edge, the album comes highly recommended. Like Atoms For Peace on Facebook.